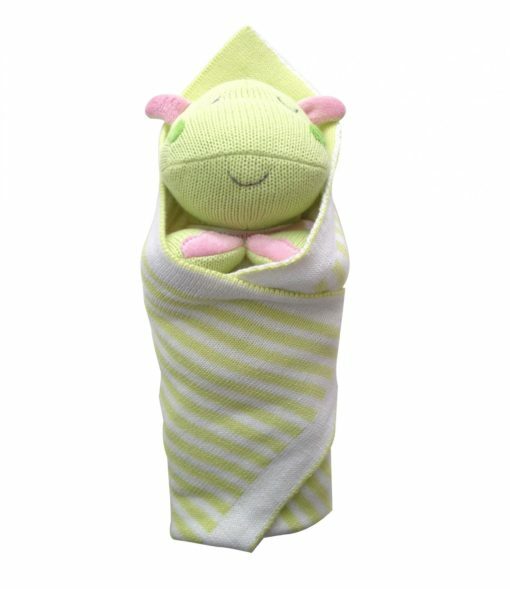 Ella the Hippo Burrito Baby™ from The Little Acorn is the hippest hippo you will ever know. 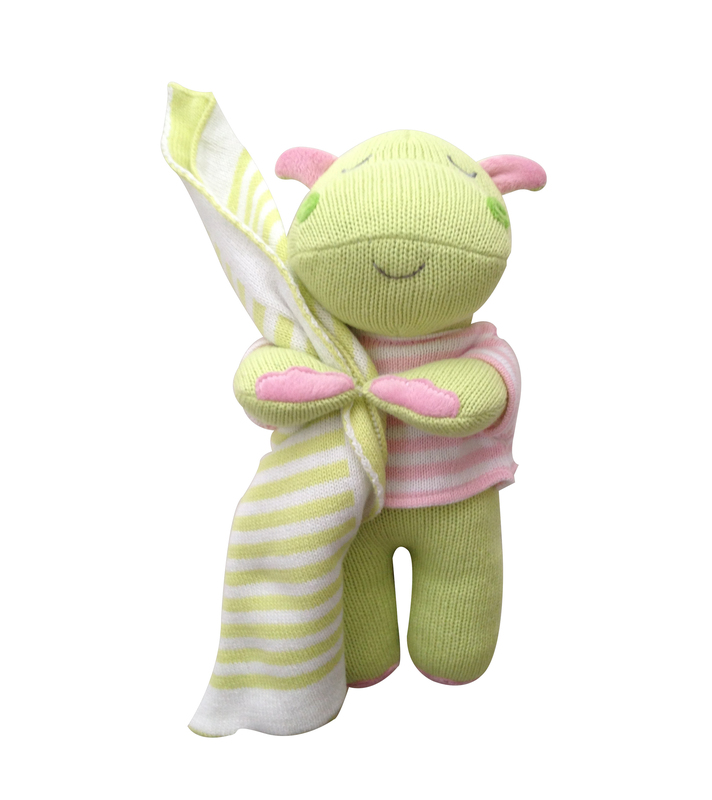 Soft knitted green Ella wears her hip pink and white striped sweater and has super soft velour pink lined ears and toes! Her little tail ends in funny little velour fringe which matches her cheeks! She loves to hold tight to her matching green and white striped blankie while she naps. Ella the Hippo Burrito Baby™ from The Little Acorn is the hippest hippo you will ever know. Soft knitted green Ella wears her hip pink and white striped sweater and has super soft velour pink lined ears and toes. Her little tail ends in funny little velour fringe which matches her cheeks. She loves to hold tight to her matching green and white striped blankie while she naps. 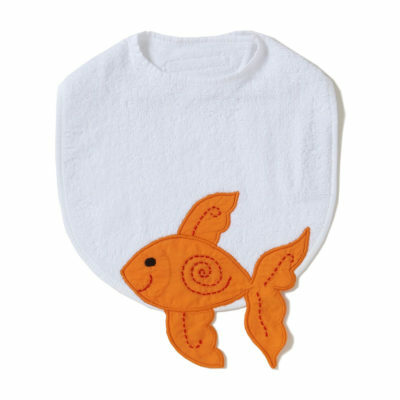 Soft & sweet Burrito Babies are a 2 piece set including a 14″ x 14″ 100% natural soft cotton sweater knit Lovie blanket that comes swaddled like a Burrito around a 12″ handmade soft 100% cotton knitted sleeping baby animal. Instructions for swaddling are included along with a name-tag. Each Burrito Baby animal has a name. 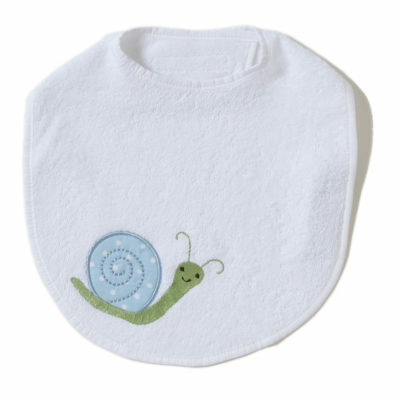 On the back of each baby animal is a tiny Tooth-fairy pocket. .
Swaddled with Love, Burrito Babies™ grows with a child. 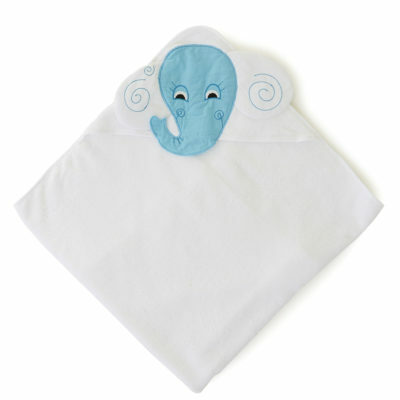 At first, Baby will enjoy the Lovie blanket to snuggle with. As they grow, baby enjoys wrapping and un-wrapping Burrito Baby in the blankie. 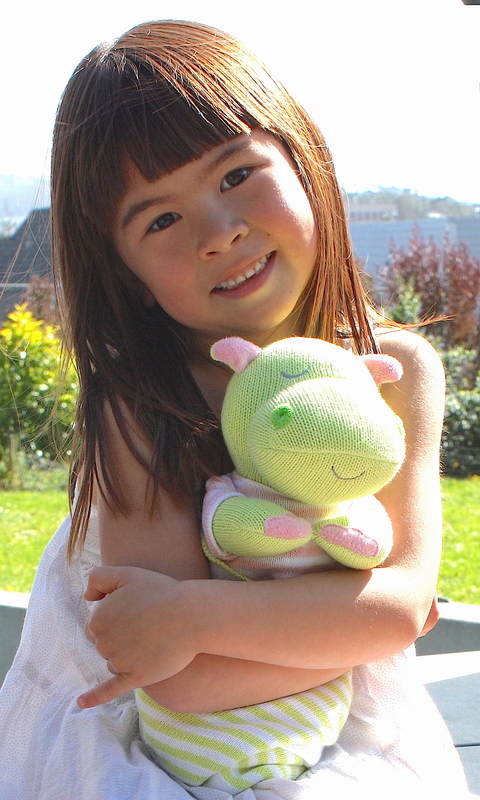 As a child, Burrito Baby is a keepsake Tooth-fairy pillow w/ pocket. The Little Acorn’s Burrito Baby™ will “Grow up happy” with little one! Content: 100% cotton sweater knit.